All glass construction with silica sheathed heaters ensures top purity distillate at an economical price. Fitted with a control device to turn off the heater when the collecting reservoir is full. Prevents overflow if the still is inadvertently left switched on when unattended. With two independent safety thermostats to prevent over heating in the event of an interruption to the water supply. The unique condenser design ensures that the droplets of distilled water remain in contact with the cooling coil for the longest possible time producing cold distilled water and pre-heating the boiler feed to increase efficiency. Screwthreads are incorporated on all water connections so hoses can be fitted and removed easily and safely without risk of breakage. 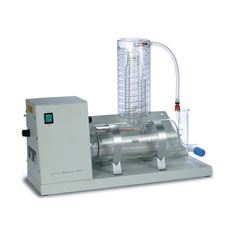 Built in acid addition funnel and drain stopcock allow easy de-scaling without dismantling the glassware. The stand is pre-drilled to facilitate wall mounting. Please note water still heating elements are excluded from our 3 year warranty and are only covered 1 year.